Woodcliff Lake, NJ – July 11, 2016- MINI TAKES THE STATES 2016 (MTTS), the eagerly anticipated two-week cross-country rally for MINI owners and enthusiasts, kicked off this weekend in Atlanta, GA. The bi-annual trek will travel track-to-track through America’s open roads, stopping in 14 cities over 15 days with thousands of MINIs. Along the way, the group will rally to #DefyHunger with charity partner Feeding America. Kicking-off the journey, a team of parachutists dove from planes 3,000 feet in the sky towards a fleet of MINI Convertibles filled with food donations, asking all to “jump in” to help #DefyHunger. From Atlanta, motorers headed north to Charlotte, NC, this weekend kicking off a 15-day adventure that will end in Palm Springs, CA on July 23rd. With a goal to provide more than 800,000 meals to families in need, drivers, consumers and others can contribute in various ways. 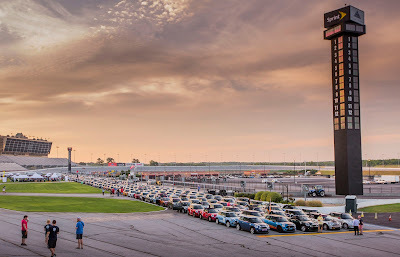 A portion of each MTTS participant’s registration fee is donated to Feeding America®, and MINI will collect food donations onsite each morning. Every motorist can also start an individual or team fundraising page . Once donation pages are set up, participants will automatically qualify for an exclusive badge decal they can proudly display on their MINI. As they continue to reach donation milestones, they’ll collect additional badges. MINI owners looking to join up with the rally can still register at MINITAKESTHESTATES.com or on-site the day of the event in each city. Videos and photos from today’s event are available for download on MINIUSANEWS.com. Daily updates from the road are also available on the MTTS 2016 Blog on MINIUSANEWS.com. Media interested in updates on MINI USA can also follow us on Twitter at @MINIUSANEWS.